Culture is the way you speak, you move, you approach or react to others. In short, the ways you communicate yourself. Culture is “embodied” in you. Let’s make it clear with two stories. - Shall we go for a coffee afterwards? - Sorry, but ….I am married!! ‘What a #@%!’ man!” she still repeats in astonishment! What I meant was just a chat after work! Obviously, what Ellen experienced as an ‘offensive rejection’ was not just due to the Dutch custom of early dinners. answered Petra, clearly irritated by this remark. I thought we were somehow closer together”, is what Esmeralda years later relates about this episode. For her, you can make such a teasing remark to someone you consider close. It is just a way to initiate an intimate a more personal chat! ‘You do that with people you feel close not with every one off-course’! she mentioned. Esmeralda has, in the meantime, moved to France but, as she recalled, she never really found the way to feel at home in the Netherlands. experienced rejection and clearly disengaging responses. But also their Dutch colleagues felt pretty uncomfortable! an irreconcilable break down of the relationship! It is thus not just a matter of misunderstanding the other’s intention? 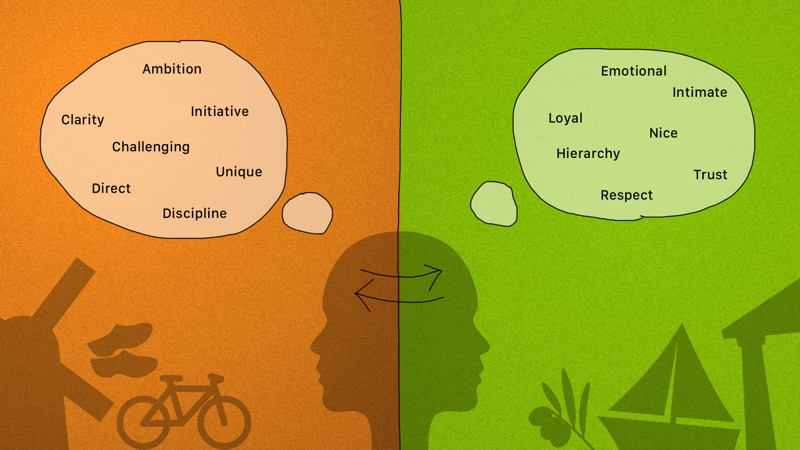 But, about how culture informs our behavior and the values we prioritise in life? For the Dutch or other individualist societies (USA, UK, Scandinavian, Australian, ..) personal proposals at work may imply flirting and, separation of personal and professional life is a well-known norm. 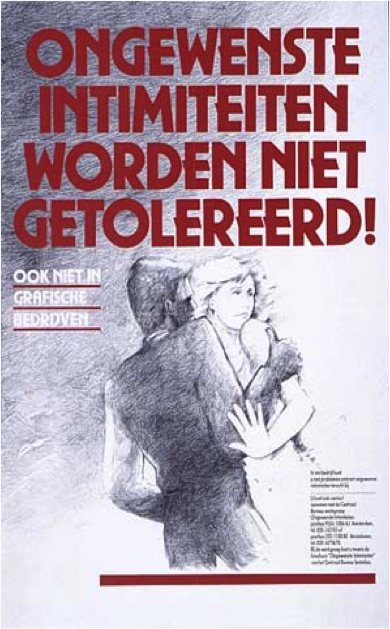 In the Dutch society, ‘undesired touching’ at work can be considered as ‘sexual intimidation’, and is even protected by law. Whereas in the Southern European contexts barriers between work and personal life are not so sharp and physical or emotional intimacies feature regularly in people’s behavior. What friendships means to you? “ …True friends help us deal with any problem we face. Adolescents with a Collectivistic cultural background, in the Netherlands, shown to appreciate sharing their most personal feelings with and receiving emotional support from friends significantly stronger than their Dutch counterparts (2). Another important difference is that people from individualistic do not mind talking about their very personal issues with anyone even with strangers. Cultural comparison of attachments to family and friends reveal the As the pioneer in Cross-Cultural comparative research, Harry C. Triandis et al. (1990), has concluded, emotional attachment to family and friends is one of the most important aspect in distinguishing cultures. 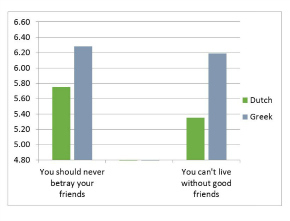 Our findings, illustrated in the diagram, just reconfirm the difference: Dutch individuals endorsed these aspects of friendship much less than the Greeks. Yet, in general and beyond cultures, the same may hold for women as compared to men (3) ( ‘Biculturalism and Group Identification‘, ). Our comparative study, however, aimed at investigating how expats, coming from a more collectivistic culture to the Netherlands feel and cope with the dominant Dutch norms and values. Present-day Dutch do not seek stability, loyalty and mutual emotional support in their relationships. They may even associate such traits with an unstable personality. The two ladies in our stories mentioned above, by being as spontaneous as in ‘own’ cultural context, experienced plain rejection. It’s however so true! Confrontation with disengaging responses, is a clear and redirecting feedback: the harder you mind rejection the more you will think twice before showing the same behavior again. Yet, it’s not only the desire to avoid rejection by other (4) that constrains spontaneous behavior (= culture) learned in home culture. These expats more or less realize that what for them represents an ‘ideal’ friendship is much less likely to flourish in the Dutch context. However expats in our sample who have lived here in average 10 years, independently of their integration in other personal traits like, efficiency or self confidence, have not changed their ideas about how friendship should be (answers of question 1). On the other hand, and this is due to the power of the environment, ‘friendship’ no longer counts in their life as much as it used to when in own culture (estimated with questions like question 2). The culture we are raised in inform thus the kind of wishes and expectations we have from our friends or our connections! * What kind of relationships then does work in the Dutch context? * What should expats do to benefit from the Dutch reality?